There are many perks to doing Musical Theatre for a living: free cardio, for example. "Fun" is what I hear most from people. "Oh, that sounds like fun," is a common response when I mention life behind the footlights. And to their credit, those people are right. Theatre is fun! What they don't know, however, is "fun" barely cracks the Top 5. Much higher on my list of perks are the moments you see the story you're telling onstage relate to what's happening in the world offstage. It's sometimes scary, often inspiring, and always magical. It's what we call "life imitating art," and I'm experiencing a healthy dose of it right now. I'm currently in a production of Cabaret at the Welk Resort Theatre San Diego. 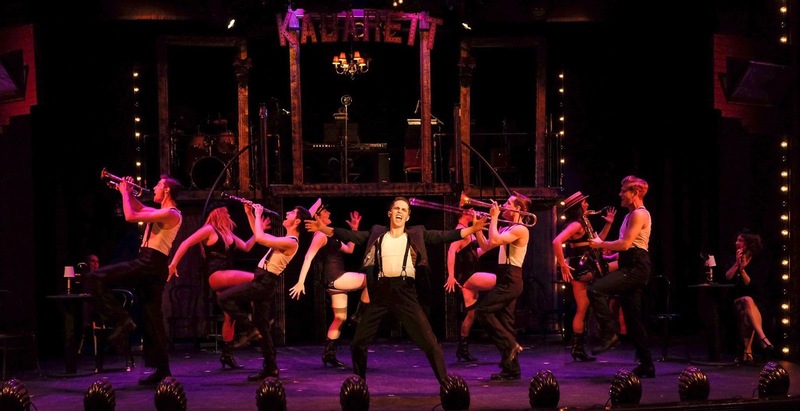 Cabaret is a brilliant piece of theatre because it's a musical about WWII and the Holocaust without literally telling the story of either of those things. Instead, we tell the story of how some people made those things happen while many others let them happen. So how does something so dark bare a striking resemblance to 2015? Well, if you had asked me two weeks ago what this year would be remembered for, I would have said "racism and hate." This week, I'm happy to say those things might only come in second. Now believe me, I would much rather give second place to something else like Jurassic World, or, I don't know, the return of culottes. Anything, really! But the acts of hatred that keep popping up across our country are impossible to ignore. What's really disturbing is these events are being treated more like tropical storms than what they are. As it happens, one area is devastated; the tragedy grabs the nation's attention and sympathy, but then the storm somehow disappears, leaving that community to clean up the mess and allowing us to go back to our lives until the next one falls from the sky. I'm sick of the cycle. Are we too easily distracted? Or do we choose not to see the issues at hand? In the case of Cabaret, it's both. To me, the show is about what can happen when we're asleep in our lives. These characters demonstrate how easy it is to convince ourselves something has nothing to do with us when it's not knocking down our doors. And heaven knows there are plenty of things to distract us: greed, addiction, and maybe most terrifying, the apathy of being too comfortable. But the common denominator between these distractions is their ultimate conclusion: When you only do something if you have to, it will always be too late. I wish I had a good solution for the problems that currently face our nation: Get angry? Write a Facebook post? Light a candle? They all seem futile at best. Where I find gratitude, however, is right now I get to do something. I get to be onstage in Cabaret and tell this story to an audience who will hopefully carry it with them out of the theatre and do something as well. So Wilkommen. Bienvenue. Welcome. For better or worse, we're all in the Cabaret, and the time for action is now.